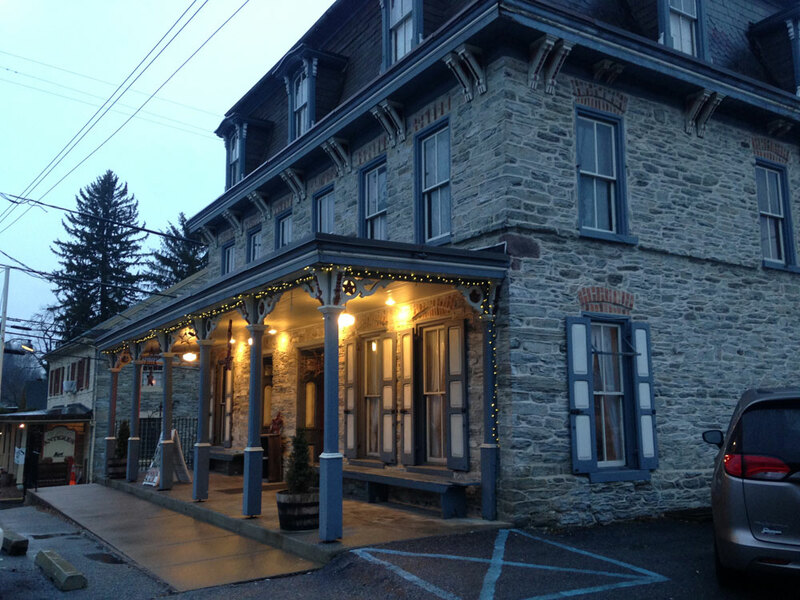 Berks County Eats takes a road trip to Lebanon County this week for a meal at the historic Franklin House Tavern in Schaefferstown. It’s been a long time since we took a road trip for Berks County Eats. Our last stop outside the county was in July of last year, eight months ago when we visited the Revere Tavern in Lancaster. Ironically enough, our next road trip takes us to another historic inn named after a famous figure from the past: the Franklin House Tavern in Schaefferstown. I have a vague childhood memory of a family meal at the Franklin House. It had to have been 20 years ago when my grandparents still lived on a farm outside of Schaefferstown. In the years since, Julie and I have driven by the restaurant countless times. But it was never our destination. But the more we drove through Schaefferstown, the more we wanted to stop. Our first visit finally happened in late February. We dropped Jakob off at my parents and continued on to the Lebanon County landmark for a Saturday evening dinner. 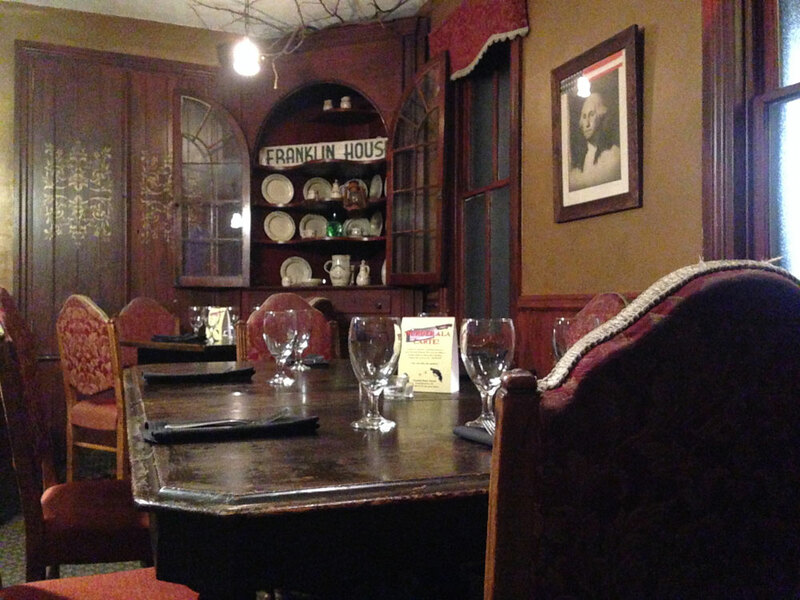 The historic inn is essentially divided into two sides – the restaurant and the tavern. We were on the restaurant side, the more refined, finer dining experience. We were led back into the Washington Room, a small-ish dining space with our table for two, three tables for four, a table for six, and a table for 10. In buildings this old – it was erected in 1746 – rooms are small and seating can be tight. But we were comfortable at our little table in the corner of the room. During our meal, there were only two other tables occupied in our dining room, but we saw at least five different servers and runners coming through. Our waitress was the second person we saw, after another waiter in the room breezed by after taking another order. “Be there in a sec,” was the gist of what he said. Thankfully, he wasn’t our server. The meal started with salads. 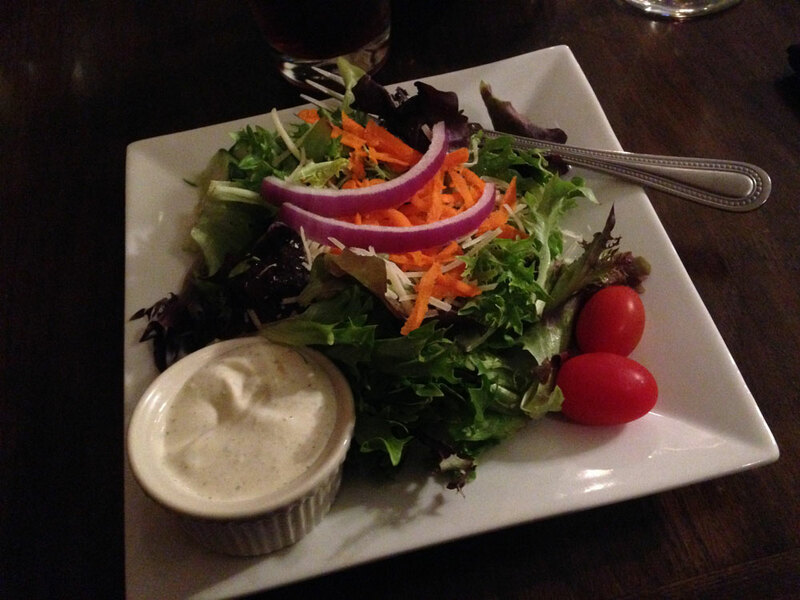 I stuck with the house salad with ranch dressing while Julie upgraded to the Caesar. 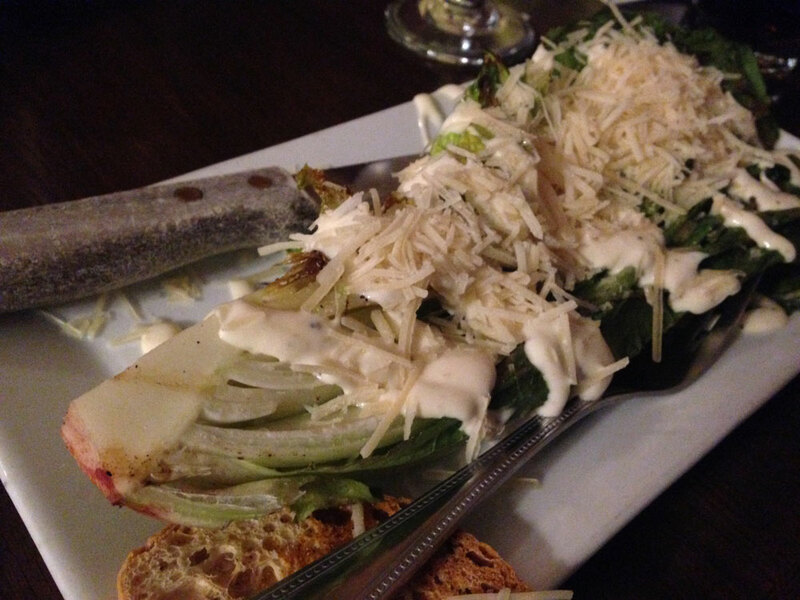 The presentation on both was beautiful, and the house salad included one nice addition: fresh Parmesan cheese. It was a subtle enhancement. Julie’s Caesar salad shined thanks to attention to detail. The lettuce was grilled, bringing out more flavor and making it feel special. A small crostini was served on the side and it was better than any crouton that would have been served on top. It was worth the $3.25 upgrade charge. 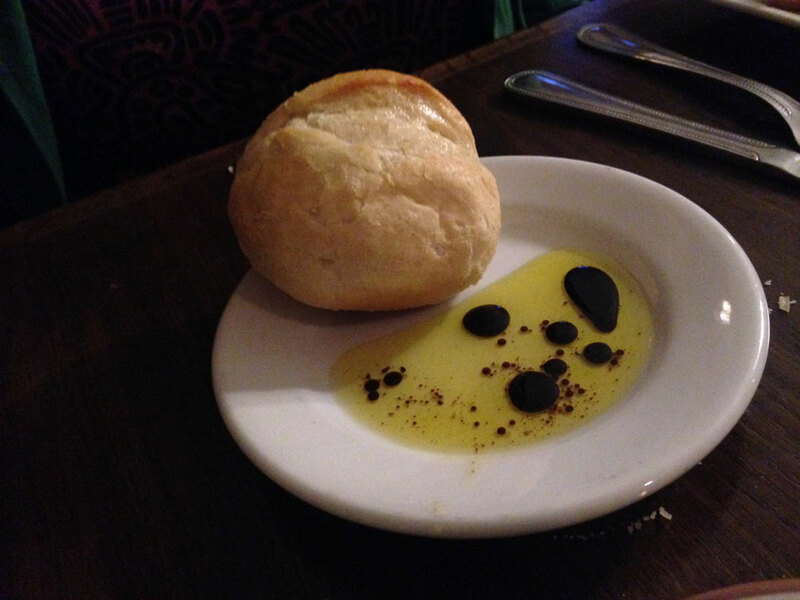 Between our salad and meal, we were served a pair of dinner rolls. Set on the table was an oil and balsamic blend for dipping. Oil is great. Balsamic is not. To me, it was an attempt to be too fancy. The rolls would have been better served with butter. I found it to be a mixed bag. On the one hand, I loved the additions to the dish – the sausage was very good, and the rum raisins provided sweet little flavor bursts. 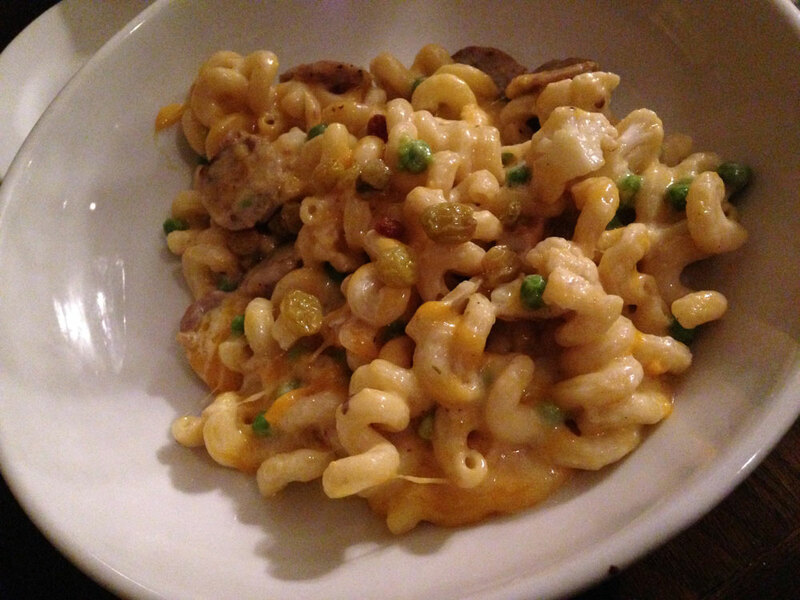 On the other hand, I was really hoping for more of a cream sauce and less of a traditional mac-and-cheese. The Parmesan cream didn’t jump out. On the contrary, I didn’t taste much Parmesan. And I felt like my meal had been completed before Julie’s and was sitting for a few minutes. Not that it was cold, but I could tell that the cheese had cooled slightly. Overall, it was still a good dish but it could have been great. Like the Boursin fried chicken. That was Julie’s meal, and it was a great dish. 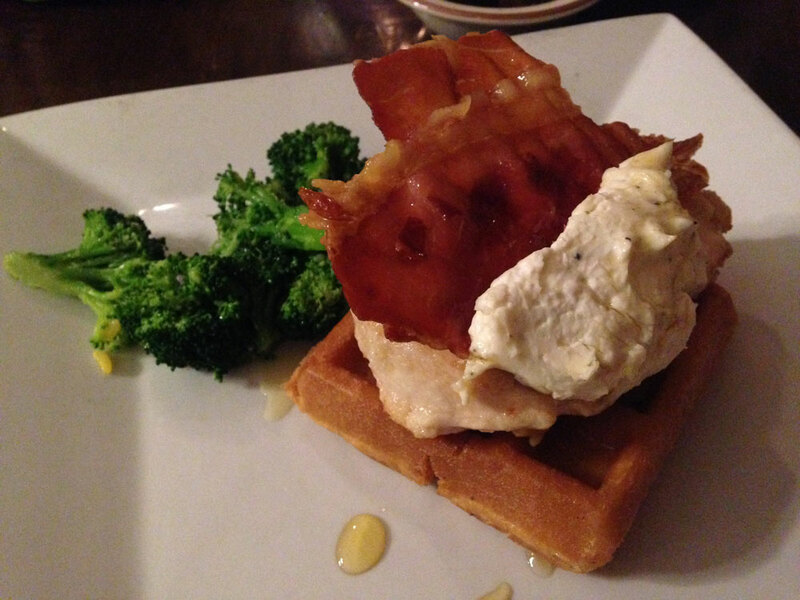 The Boursin fried chicken was on the specials menu, and there wasn’t much description of it, other than that it would be served atop a waffle with prosciutto and a honey drizzle. It was a beautiful presentation with a lightly breaded chicken breast topped with the cheese and a slice of prosciutto. The only thing better than how it looked was how it tasted. Boursin cheese, as we would come to find out, most closely resembles cream cheese. It essentially took the place of a sauce, giving a sweet, creamy flavor that was in every bite. The prosciutto added another savory element while also giving salty notes to the dish. Even the waffle added additional depth to the dish. I was in love Julie’s entree, and I definitely had food envy. We weren’t celebrating a special occasion, but we decided to make it special by adding dessert. Of the four choices on the dessert tray, the one that appealed most was the lemon berry cake. The cake was layered with Mascarpone cheese and topped with raspberries and blueberries and a concentrated raspberry sauce. 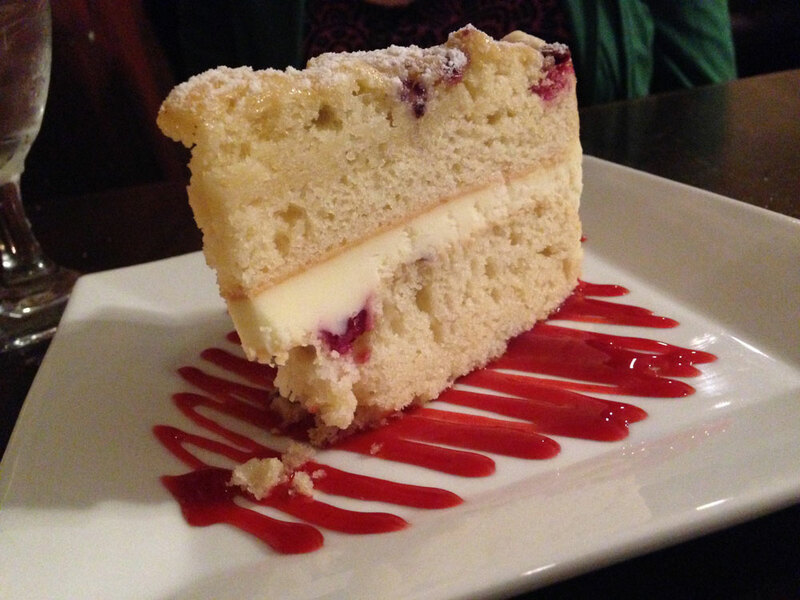 The cake reminded me of a lemon cream cookie, but the addition of the berries put it over the top. It was definitely worth saving room for this. Even with dessert our night out didn’t break the bank. Our total bill was $55. While it’s a little more than we pay for everyday dining, I was expecting $60 or more for our meals. And we would probably spend that on our next visit because our entrees were at the low end of the price scale. 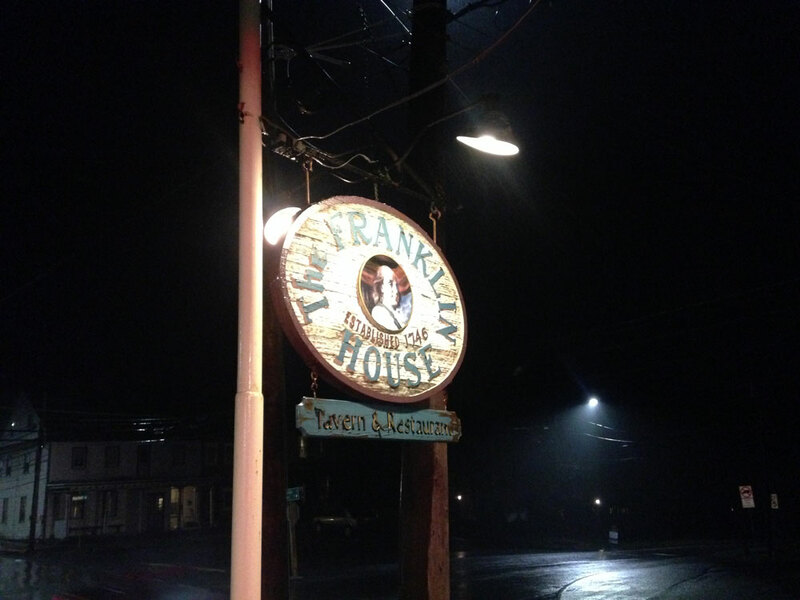 It wasn’t a perfect night, but the Franklin House Tavern really did impress in many ways. We enjoyed some exceptional dishes in an incredible historic setting. 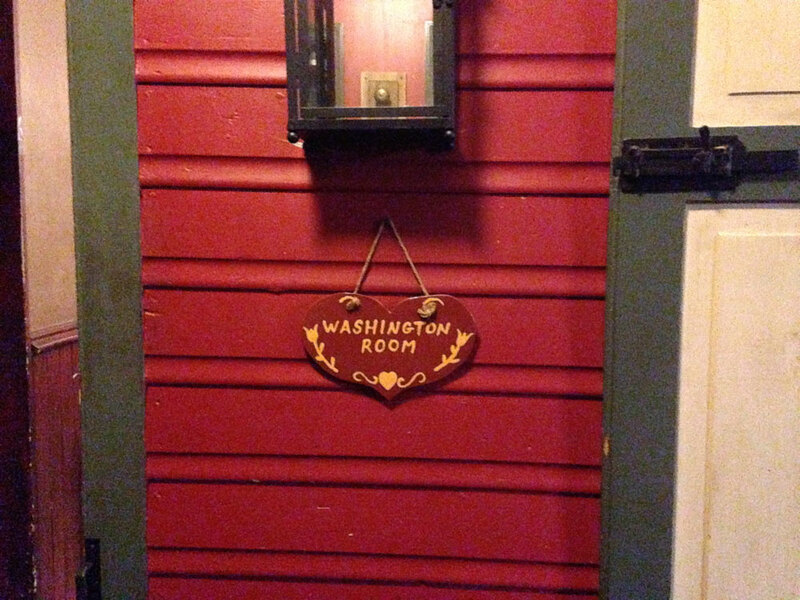 And now I have another memory from the Franklin House that I’ll remember for a long time.